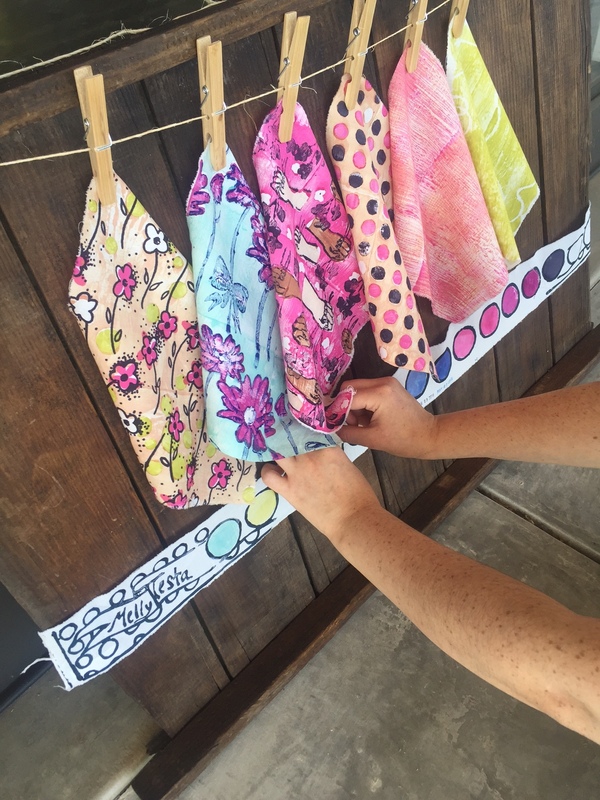 I’m honored to be closing out Melanie Testa and Carol Soderlund’s author blog hop for their brand new book, Playful Fabric Printing that is now available! As the publisher, it was a pleasure to work with these two talented artists so this book could at long last see the light of day. 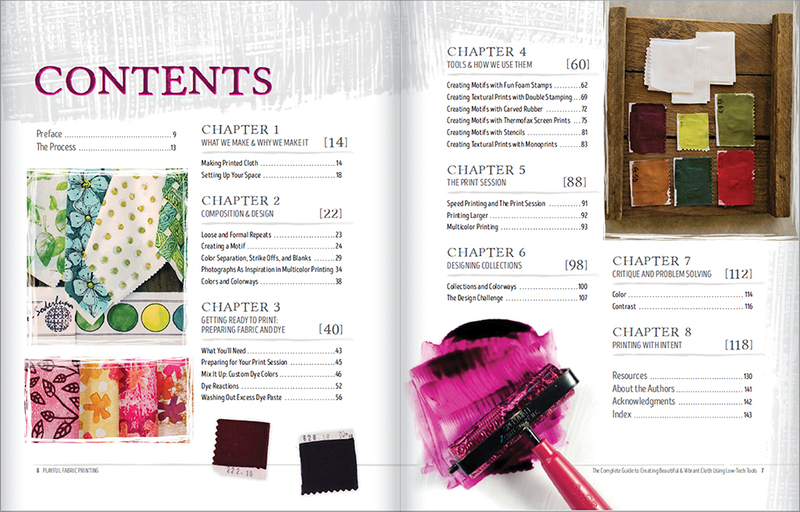 The book is chock-full of techniques, color recipes, and step-by-step instructions for printing your own fabrics using thickened dyes and low-tech, easily accessible tools. 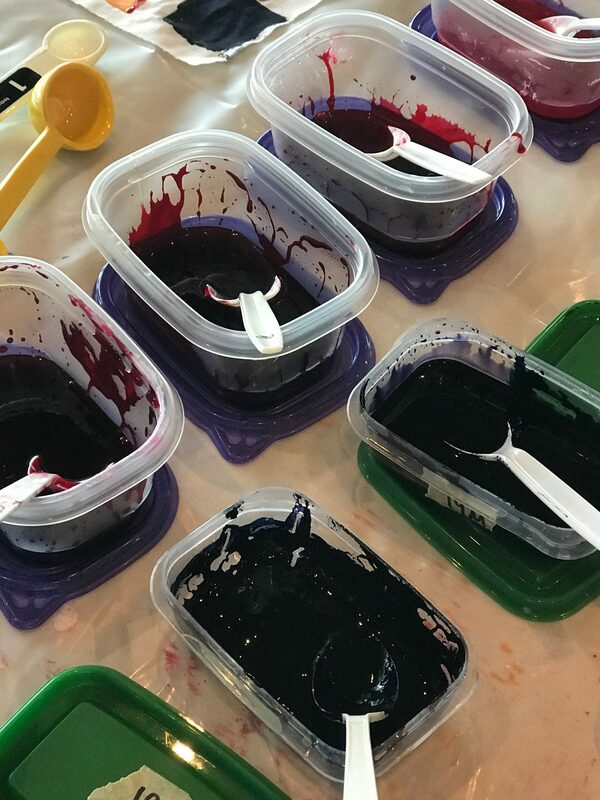 I get asked all the time, why thickened dyes vs. fabric paint? I actually like to print with both. Paint sits on top of the fabric, and when dry, it can have a bit of a stiff hand to it (depending upon the brand and type)–sometimes this is wanted as it adds wonderful texture. I use fabric paints most especially in my art quilts and fabric collages. 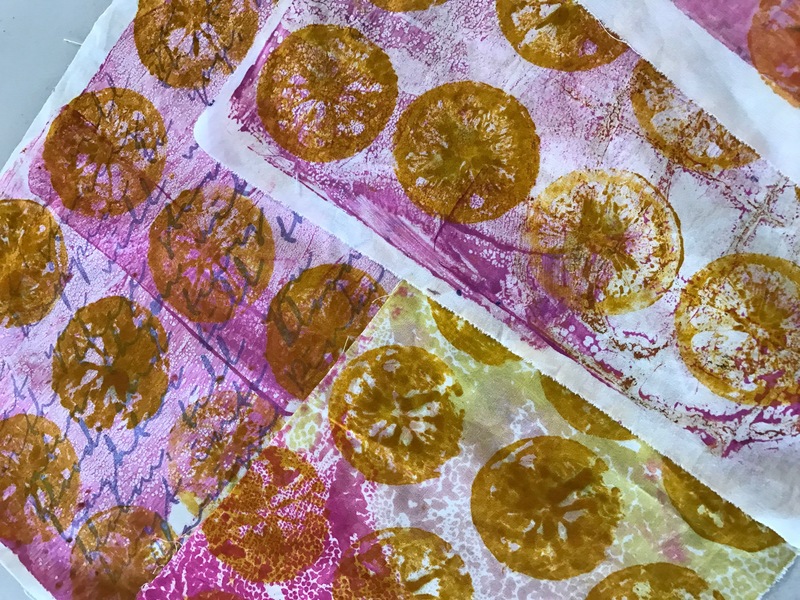 However, when you use thickened dyes (dyes with print paste added), the dyes act like paint–you can stamp, screenprint, monoprint, etc., but when you wash the dyes out, you are left with a fabric that has a very soft hand, and plays really well with commercial fabrics for quilts and projects. 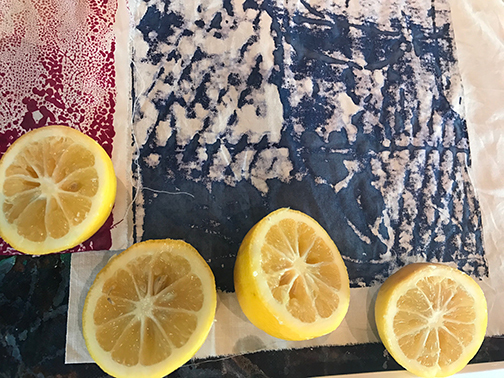 The other day I plucked some lemons from my Meyer lemon tree for stamping. 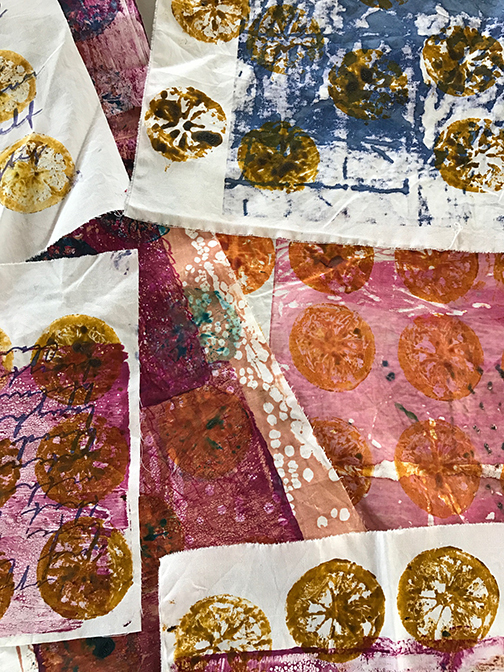 I like to layer color on my prints; I often first monoprint a background color with thickened dyes, let that layer dry, and then apply a Thermofax screen, stamp, or stencil, letting each layer of thickened dye dry before applying another layer of print work. Once I think a piece of fabric is finished with layers of printing, and the fabric is completely dry, it’s time to “batch” the fabrics so that the dyes permanently soak into the fibers. 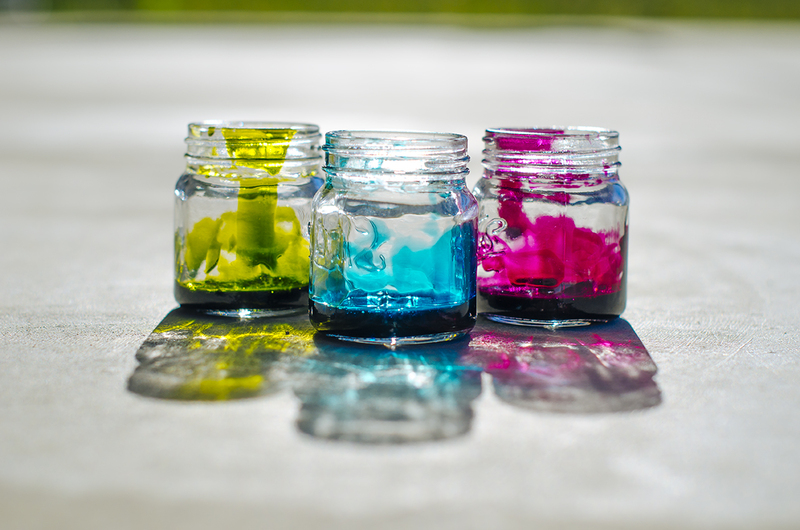 (If you skip this step, most of the dyes will completely wash out when rinsing.) Batching takes time and a moist environment, and traditionally you batch fabrics overnight by rolling the printed fabrics in plastic and placing in a dark bathroom or closet. This means waiting to use the fabrics…and I do not like to wait. However, Carol and Melly taught me the best hack ever: creating your own steam system where the fabric dyes set in just 20 minutes. The directions for assembling this steam system are in the book, and for me, one of my biggest take-aways. 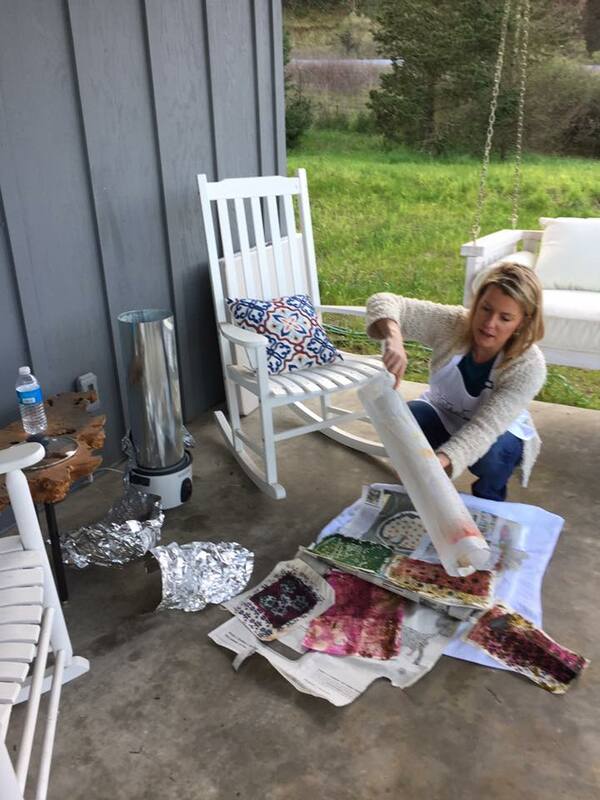 This easy-to-assemble steam system means I can walk into my studio in the morning, and just a few hours later, come away with stacks and stacks of printed fabrics that I can then quilt with immediately. 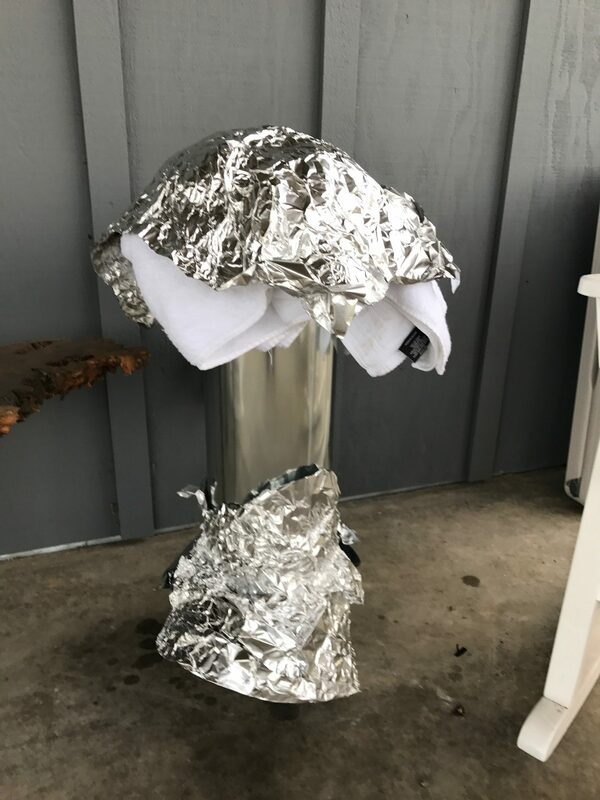 All you need is a a rice cooker with a steam basket, metal duct, wire mesh, cheesecloth, newsprint, foil, and a towel, among a few other tools for assembly. Below I am showing some local quilting friends how this steam system works. To the left in this photo, you can see that the metal duct is sitting in the rice cooker with a steam basket (with some water on the bottom). I am holding the inner tube (rolled wire mesh with cheesecloth stitched around it) where you wrap your fabrics with layers of newsprint. Once you’ve rolled your layered fabrics and newsprint around the inner tube and secured with masking tape, set this inner tube inside the metal duct. Place a towel on top, then wrap both the top and the bottom with foil to keep the steam from leaking out. Set your timer for 20 minutes, and when done steaming, the fabrics are ready to be rinsed and stitched. I have so many plans for quilt making with my prints, and I am really looking forward to experimenting with the numerous techniques and dye recipes in this book. So to close out this blog, I want to ask the following question. Leave your answer in the comments area, and I will randomly select a winner to get a free copy of the book. 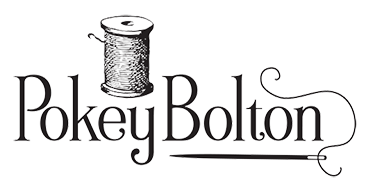 Question: If you could create your own fabrics, what motifs would you feature? And if you have printed your own fabrics and they are viewable online, please share the link so we can see! My next set of motifs are going to be ‘Captain’ related, featuring boats, whales, knots and starfish. This is for my Dad, The Captain. (I don’t need to win a book though). I can’t wait to see this fabric, Melly! My favorite motif right now is a decaying leaf. I use leaves, trees, birds, wildflowers, nests and feathers a lot. The book looks wonderful! Loved this post, Pokey! I made a steamer a decade ago using a leftover piece of our wood stoves 2 story stove pipe. Still have it and now I can use it again! I’ve always used symbolic universal symbols ala Carl Jung but now I’m needing to go back to childhood in Alaska roots and into my wild woman magical side. Who knows where that will lead me! I’ve used many geometric shapes and natural findings to make my own stamps and collographic plates. I’ve combined them and used for art quilts. Sometimes I enjoy the printing and painting process more than the stitching! Thanks for the blog post. I love to use fresh leaves (caladium) and also hand carved blocks. Sadly, I haven’t photographed them for posting. Oh wait. Yes, I will have some of the tunics I made recently on my Etsy site http://www.etsy.com/shop/floozieproductions. Not posted yet but will by end of week. Thanks for the great images of the steamer!!!! great solution. Love the rice cooker steamer. A new use for an unused appliance!! YEAH! Hearts are my favorite motif. I love working with images from my night dreams. The imaginal realm offers a different perspective to the world of form and reality, while inviting the imagination to explore and discover in new ways. So a tree may look different in the dream world, yet still resemble a tree. I use basic shapes–triangles, circles and squares. Circles and leaves are my go to! You can see some on my blog http://notesfromstudiob.blogspot.com, check under the circle quilt heading and the weekly leaves. Love the rice cooker steamer! These are amazing! Thanks for sharing this idea. I’m just starting to paint on fabric, but I am creating a print on the fabric like the cheater panels are (all hand painted) and then quilt it. You are one of the people I learned from via Quilting Arts TV show. Thank you for inspiring! I love microscopic imagery. So I tend to magnify things until they show the essence at a cellular level. I don’t need to win a book, either! I love the one I already have! I love hard-to-read script, dripped paint, and messy lines. Thanks, Pokey! I would likely use leaves and dragonflys on my fabric. Those are my two favorite things to make stamps and stencils of. I also enjoy fish and birds. I love what you have shown us! Leaves are a favorite. Love the rice steamer instructions. Thank you & congratulations again. Love using kitchen produce to stamp fabric organically. Great to see the steamer idea and I look forward to seeing this book with its many great ideas. I am into Art Deco designs right now, can’t wait to try out some of these techniques. Hearts, circles, swirls and leaves are all motifs I like using. Thanks for the chance to win this book. I look forward to seeing the other books you publish! As I’m sitting here reading this I have in front of me bubble wrap, pine cones, palm leaves, and bird feathers. Now I’m thinking about how awesome this combination would be for a print. Pokey thank you for your inspiration and your generosity. I always look forward to your posts and know that I am going to walk away with my mind going round and round! 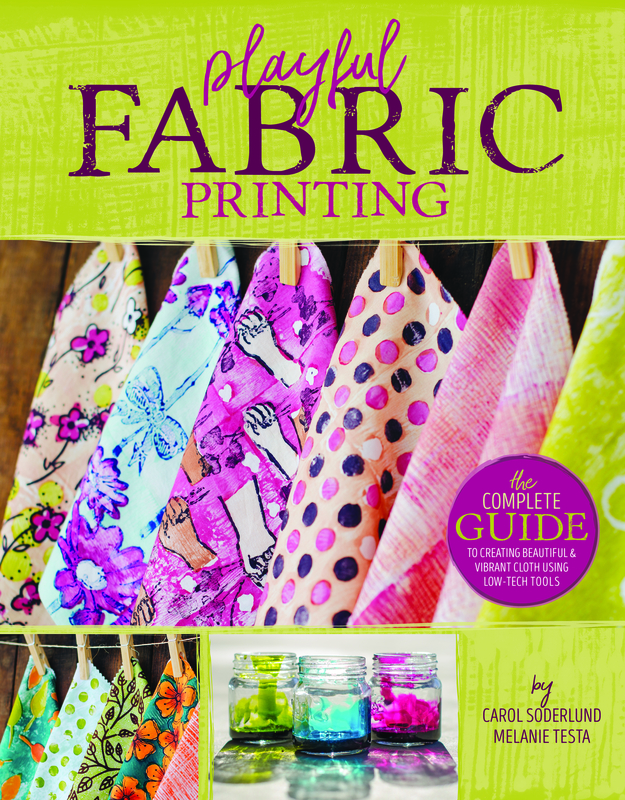 This book looks like it is full of lots of amazing fresh ideas for fabric design! I love creating fabric using stamps I have made, stencils, found objects, paint, pens,etc. Two of my favorite stamps to use are my butterfly and dragonfly. Birds, branches and berries come to mind as favorites to print. I haven’t done much printing. Right now I’m trying to create the ‘foam’ that appears on top of water when the ocean reaches the shoreline at the base of a huge bluff…Oregon Coastline. None of the fabrics in my stash are working. There’s so much depth to water that it’s difficult to achieve that imagery with fabrics. Looking at this blog, I’m wondering if that one pic of the blue background with bumpy white paint might be a direction for me to try. What did you use to get that texture? Would love to win your book! My favorite motif is the peace sign. I have been using it a lot lately. Thanks for the chance to win a copy of this wonderful book! Looking forward to seeing what comes next from your publishing empire! I would feature natural items – leaves, twigs, silhouettes of trees, rocks-lots of texture! My favorites are flowers and leaves of all kinds. I love to create my own fabric. If I were creating a fabric I would use the petrogylph shapes in vibrant colors. My second choice would be fanciful flowers in lots of different colors. Anxious to get the book! A slinky LOL….it would certainly be experimental…or a bunch of different size springs. I love geometric shapes with spirals being my favorite motif. Southwestern geometries are calling me now. I have painted fabric before but looking forward to trying dye paste stamping. Hope I win the book to learn their steaming setup! I don’t really have a “go-to” motif. I’m thinking maybe I should work on finding a motif I’m really drawn to. Having a copy of this book might inspire me to do just that! Hearts are my favorite. Followed by anything organic, leaves, ferns, fruit, veggies. I don’t have much experience yet but am really looking forward to experimenting!!! I like using geometric shapes and brush strokes and trying to create fabrics with a vintage feel. There are so many possibilities! And that steamer looks like such a time saver! I’ve not tried fabric printing as I’ve never really know where to start. When I do get my hands dirty, I will experiment with house motifs: doors, windows, roofs, classic furniture, etc. I love using a variety of motifs – from a leaf to a tree, a feather to the bird, an abstract shape or a sliver of a full size architectural drawing. My favorite is the fact that there are many ways TO add them! I’ve tried printing with thickened dye only in deconstructive screen printing so I’m looking forward to using the dye in this application. Thank you for the opportunity to win the book! All things nature but right I have been experimenting with objects that produce an insect motif. I have created rubber stamps with a tree/trees motif and would love to try them on printing some fabric. 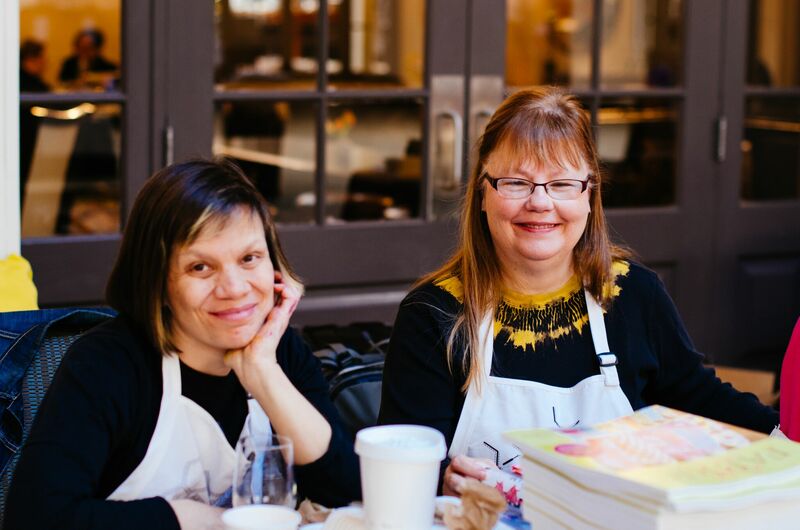 Using Melanie’s and Carol’s dye techniques would be a great way to start. I love butterfly and triangle motifs in my work. Can’t wait to get my hands on this book. Thanks for publishing this Pokey. The steam method is so very interesting, and quite new to me! My favorite motifs have been flowers, but I also like simple doodles! Thank you! I love hearts and use stencils made out of freezer paper, stamps, rubbings and free-hand. Lately I’ve been using geometric shapes but often use flowers, leaves & textures from nature. 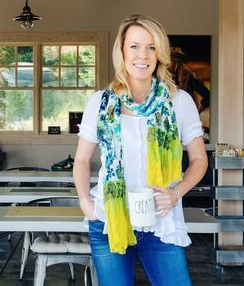 Some on Instagram @lindastextiles Love the layering in your prints. 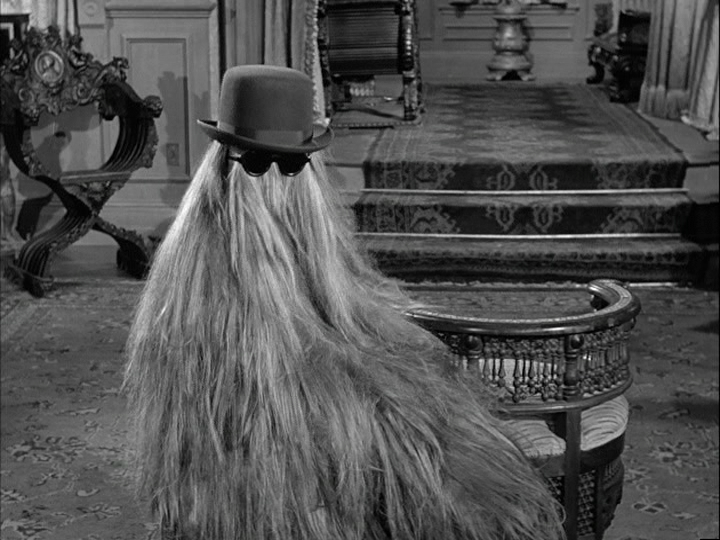 lol Cousin Itt!! Wonderful fabric, thanks for showing us! I like lines, circles and words for motifs. This method looks great! I hate waiting for stuff too! I think with my personality I would do just about anything – leave’s,flowers, found objects and anything I can think of! Trees and leaves, all the time, but I’d like to get into some text. Love stamping and stenciling and want to do more. This book seems like the best resource yet! I like leaf motifs and flowers – I have yet to try out my stencils and dyes though! This book looks like great inspiration!!! I like dots. All sizes. I’d love to create my own paisley motif too. I like leaves and feathers. I actually stencilled some feathers not to long ago and the went into the back of a quilt. The book looks wonderful! I will look for that. Thanks for sharing. My favorite motifs??? Hard to say. It could be leaves, because I was doing some eco printing before winter took a hold. I like the vision of branches spreading out and grasping for whatever it can get at. This book looks like it contains a wealth of knowledge. I will get a copy one way or the other!!!! Thanks!!! What a neat book! Flowers are probably my favorite motif, thanks for sharing! I use plastic shower curtains and tablecloths from the dollar store instead of newspaper. Fear of newsprint transfer. Can be hung on clothesline and hosed down if needed. Thank you for bringing it into reality, Pokey!! It is so Interesting to read what motifs folk are drawn to. I think motif is a visual means of communication. As such, my favorite motifs change with intention. For me, textile design is an art form with historical context. I feel a blog post coming from on! Today I think I would print polka dots! Or stripes. Or…? ?